One of the blogs that I read on a regular basis is Women Living Well. I just love Courtney’s cheerful spirit and her unending encouragement for moms, all the while letting her love for the Lord shine through. She really helps women with all aspects of their lives: marriage, child rearing, spiritual enrichment and even features some delicious recipes from time to time. When I heard that she was writing a book, I wanted to read it immediately! Courtney is so well-versed in Scripture and seems to know how to apply it to every feature of a wife/mother/woman’s life that I just wanted to get every bit of this godly woman’s knowledge into my brain. It was a long wait until October, but I finally received my copy and poured over it in just days. 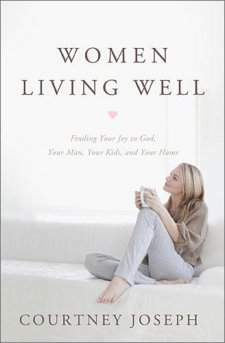 Women Living Well is organized into four sections; there is advice on how to deepen your relationship with God, how to have a strong marriage, how to parent well, and how to succeed in homemaking. Each section is chock-full of practical recommendations on each topic. I particularly liked the section on “motherhood mess-ups,” in which Courtney discusses how to handle those times in which we mess up with our kids. Here she outlines specific steps that we can follow to repair our relationships with our children, which I found invaluable. Perhaps the thing I appreciate the most about Women Living Well is that is written to be a true help to the modern Christian woman. Never does Courtney make you feel like she is criticizing you or make you feel inadequate. In fact, in almost every chapter, Courtney tells you about mistakes that she made as a new bride and new mom, making her very relatable and trustworthy. All in all, Women Living Well is written by a gentle, loving friend that wants to assist you become the best wife and mother that you can be. With this book, any woman can make great advances towards being the kind of wife and mother she has always wanted to become. For a sneak peek into the book, head over to Amazon’s Women Living Well page (affiliate link). You can also find Courtney at her blog Women Living Well. Thanks for sharing this review, Erin. This definitely sounds like a great book that I need to read.